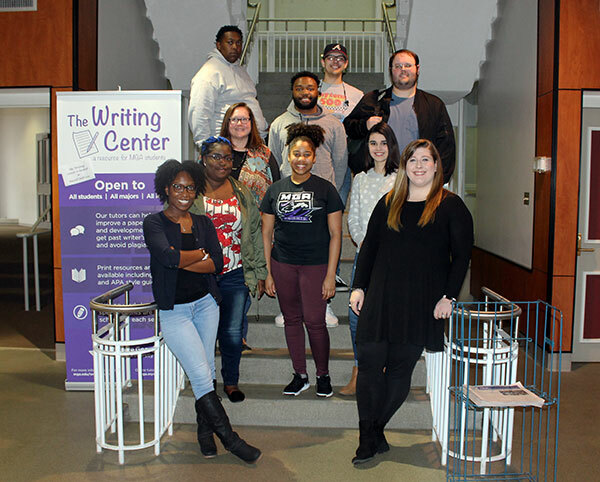 Rebecca Edwards, far left on the third row, and some of her upper-division New Media and Communications majors based on MGA's Cochran Campus. Nikea Conyers of Decatur planned to study theater when she moved to Cochran a few years ago to enroll at Middle Georgia State University. At the time, MGA still offered an associate’s degree in that field. When the University discontinued it, Conyers got ready to transfer to another school. Then she learned about MGA’s bachelor’s degree program in New Media and Communications. Now a 22-year-old senior, Conyers is thriving in the New Media degree program, which is growing in popularity on the Cochran Campus. The degree originated at the former college that became the Macon Campus of Middle Georgia State, but the University’s Media, Culture, & the Arts department recently has been expanding the program to Cochran. Before arriving at MGA, Edwards was an adjunct instructor at Florida State University, where she taught single camera operation, sports broadcasting, and post-production editing for radio and TV broadcasting classes. Prior to that she spent nearly two decades working in production accounting and other film industry roles in Los Angeles and elsewhere. Among other things, Edwards worked as a production coordinator for the 1996 Olympics opening and closing ceremonies and had production roles in films and TV series, including Dante’s Peak, Red Corner, Love & Basketball, NYPD Blue, Big Brother 3, and Raising Helen. She also worked as a segment/line producer for Fox Sports. She is a current member of the Georgia Film Commission and a faculty representative for the Georgia Film Academy. In late 2014, Edwards joined MGA and later became the first New Media faculty member based full-time on the Cochran Campus. The degree program there grew gradually as MGA added on to the computer labs and digital video equipment that New Media majors use. Conyers, for example, came up with ideas for ongoing video series that she and other New Media majors create. “Knights Around the World” is a series of short interviews with MGA student-athletes who moved to Georgia from abroad to play for the Knights. “She pitched it and ran with it,” Edwards said. The “Teach Me How to Play” series – short videos of MGA athletes explaining and demonstrating to beginners how their sports are played – is also Conyers’s initiative. She wants to work in television production after she graduates. Her fellow New Media majors are also making plans. Hashondra James, a 21-year-old senior from Albany, wants to work at a radio station in her hometown after she graduates. Anderson Wash, 20, a junior from Macon, switched his major to New Media after taking a public speaking class from Edwards. He hopes to work in some aspect of marketing. Nadia Turner, a 22-year-old junior from Macon, wants to direct commercials. Brittany Ervin, a 21-year-old senior from Augusta, wants to work in public relations. As MGA’s New Media majors graduate, a healthy job market awaits them in Georgia’s film and TV industry. According to the Georgia Department of Economic Development, the state’s film and television industries generated more than $7 billion in 2016, but the economic impacts extend much further. Countless jobs, everything from electricians and lighting to stage construction and real estate, are created in the process, economic development officials say. Recent projects of Cochran Campus-based New Media majors include a series of public service announcements featuring campus police officers providing useful tips to students, such as how to avoid parking tickets; video spots promoting Student Life events; and messaging for the campus health clinic. Much of the work is shown on MGA’s student-produced KnighTVision campus television initiative. A multifaceted project involving most of Edwards’s upper-division students is “Media Day” for the MGA Knights baseball team. Some members of the team, including centerfielder M.J. Rookard, are New Media majors, and they and other students serve or have served as media production interns for the athletics department. The baseball team Media Day work, now in post-production, included a major photo shoot of the players, which students designed to be more artistic than the assembly line “school picture day” atmosphere typical of such events. Media Day also included video-recorded interviews with individual members of the team. New Media major Brittany Piper, 25, a senior from Eastman, was the primary photographer for the still images, although all the students helped set up the studio for the shoot. Just four years after Piper first got seriously interested in photography, she and her husband operate a wedding photography and video business called The Piper Collective. After her Media Day work, “Sports is my newfound passion,” she said. When the Media Day production work is complete, the MGA athletics department will use the images and video to help promote and market the baseball team. Middle Georgia State’s Bachelor of Arts in New Media and Communications is offered through the Department of Media, Culture & the Arts. Learn more about the degree at https://www.mga.edu/arts-sciences/media-culture-arts/index.php.